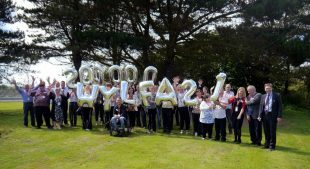 Charities from across Anglesey and North Wales attended a celebration to celebrate 24 years of dedicated fundraising support from the staff at Wylfa power station. I recently joined charities from across Anglesey and North Wales at a celebration to celebrate 24 years of dedicated fundraising support from the staff at Wylfa power station. Over that time hundreds of staff working at the power station have collectively raised more than £200,000 through the Wylfa 21 fund, supporting scores of local charities. The fund has now closed and a celebration was held on Monday, June 20 to recognise the contribution of staff and the legacy of the charitable support. Thirty charities which have benefited from the fund’s final pay-out were invited to the event. Among those receiving £700 are Anglesey Riding For the Disabled, Hope House and Amlwch Fire Fighters. I am very proud to say the staff at Wylfa have always displayed a huge generosity of spirit when it’s come to supporting our local communities. The Wylfa 21 fund was an extension of that generosity, and raising such a significant amount for so many local charities over the past 24 years is a tremendous achievement. The fund was set up in 1992 to recognise 21 years of successful generation. Staff opted in to pay a monthly contribution into the fund from their salary. Wylfa stopped generating electricity at the end of last year and the fund was closed this April. Wylfa staff will continue to support local charities in other ways. I know that the local charities, like Hope House and Tŷ Gobaith, value the support from everyone at Wylfa. The extra funding for Hope House and Tŷ Gobaith means that they can continue their great work. This means being there for children who are affected by conditions so serious that they’re not expected to live longer than early adulthood. It's great that this charity can help these children enjoy the best possible quality of life and make the most of every moment. They are there for their parents and families too, who can often find it hard to cope, both emotionally and practically. So, for everyone at Wylfa who has worked hard to raise this money, there is much appreciation from the charities and all the children and families benefitting from the kindness and support for the wider community.